Dendritic cells (DCs) emigrate to regional lymph nodes (LNs) during immune responses via afferent lymphatic channels. Secondary lymphoid-tissue chemokine (SLC), a CC chemokine, is expressed in secondary lymphoid organs and mediates the chemotaxis of lymphocytes and DCs via its receptor, CC chemokine receptor 7 (CCR7). By dual-label fluorescence confocal microscopy, we showed MHC class II-positive cells within SLC-staining lymphatic channels in the mouse dermis. SLC was a potent in vitro chemoattractant for cultured, migratory skin DCs, and it enhanced the emigration of MHC class II-positive DCs from mouse skin explants by an average of 2.5-fold. Mature or cytokine-activated, but not resting, Langerhans cells expressed CCR7 mRNA by RT-PCR. Anti-SLC Abs, but not control or anti-eotaxin Abs, blocked the in vivo migration of 51Cr-labeled, skin-derived DCs from footpads to draining LNs by 50% (n = 9, p < 0.005). Thus, we provide direct evidence that SLC and CCR7 participate in the emigration of DCs from peripheral tissue to LNs via lymphatics. Skin-derived dendritic cells (DCs)2 such as Langerhans cells (LCs) and dermal DCs 1 play vital roles in immune surveillance because of their efficient mechanisms for Ag uptake and presentation (reviewed in 2 . For these DCs to reach secondary lymphoid organs such as regional lymph nodes (LNs), DCs must emigrate from peripheral tissue via afferent lymphatics. The molecular mechanisms that regulate the emigration of LCs and other skin-derived DCs are incompletely understood. E-cadherin may play a role in anchoring LCs to epidermal keratinocytes 3 . TNF-α and IL-1β both induce the maturation of skin-derived DCs, and the inhibition of TNF-α or IL-1β production or action has been demonstrated to decrease skin-derived DC migration to regional LNs 4 . In addition, recent reports show that p-glycoprotein (MDR-1) 5 and α6 integrins 6 have potential roles in DC emigration from skin. Morphological data from skin organ cultures in both human and murine models have convincingly demonstrated that DCs from skin can enter dermal lymphatics 7, 8, 9 , although it is not understood how these APCs are recruited. Chemokines have recently been demonstrated to have important roles in the recruitment of specific leukocytes to secondary lymphoid organs as well as to sites of inflammation 10, 11, 12, 13, 14 , and a growing number of chemokines appear to stimulate chemotaxis in DCs 15 . Secondary lymphoid-tissue chemokine (SLC) is a member of a subgroup of CC chemokines (including EBI1 ligand chemokine (ELC), thymus- and activation-regulated chemokine (TARC), and liver- and activation-regulated chemokine (LARC)) that initially appeared to be highly specific for lymphocytes and had no activity for monocytes 16 . SLC and EBI1 ligand chemokine share one G-protein-coupled receptor, CC chemokine receptor 7 (CCR7) 17 , although SLC also binds murine CXC chemokine receptor 3 18 . SLC is expressed by lymphatic endothelium in the small intestine and liver at the mRNA level, although its function in that context has not been explored 11 . After observing that SLC protein was expressed on lymphatic channels by confocal microscopy, we demonstrated that SLC is a potent chemoattractant for skin-derived DCs both in an in vitro and an ex vivo model of DC migration. We determined that resting LCs express CCR7 after exposure to inflammatory cytokines that activate and mobilize LCs. Finally, we used an in vivo LN homing assay to determine that SLC and CCR7 are involved in the trafficking of DCs from the skin to regional LNs in vivo. Recombinant murine chemokines were purchased from R&D Systems (Minneapolis, MN) or Peprotech (Rocky Hill, NJ). Anti-murine SLC and anti-murine eotaxin (affinity-purified polyclonal goat IgG) as well as control polyclonal goat IgG were purchased from R&D Systems. All of the chemokines and Abs used in the functional studies were sodium azide-free and had <0.1 ng of endotoxin per μg of protein (as reported by manufacturers). Female BALB/c mice that were 8–12 wk old (Animal Production Area, National Institutes of Health, Frederick, MD) were used in all experiments and were housed under pathogen-free conditions. Migratory DCs (see below) were labeled with the intracellular fluorescent dye, calcein-AM (Molecular Probes, Portland, OR), at 1 μM for 30 min at 37°C. A total of 25,000 cells in 25 μl of buffer A (HBSS, 0.1% BSA) were loaded on the top of the filter (ChemoTx 8 μm, Neuroprobe, Gaithersburg, MD). After 3 h at 37°C in a 5% CO2 incubator, the cells accumulating at the bottom of the chamber were enumerated in four randomly chosen ×10 views (n = 4) and averaged. For ex vivo chemotaxis assays, mouse ear skin was placed into six-well plates containing RPMI 1640 medium supplemented with glutamine, antibiotics, and 10% FBS (cRPMI) (1.5 ml/well) with the indicated additions and incubated for 24 h at 37°C in 5% CO2. Migratory DCs from each condition were collected, stained with FITC-conjugated rat anti-I-Ad/Ed (see below), resuspended in 300 μl of buffer A, gated for live cells (>95%) using propidium iodide, and counted for 150 s in a flow cytometer 19 . Epidermal and dermal sheets were prepared from mouse ear skin that had been explanted into culture (cRPMI) 48 h earlier 20 , fixed in cold acetone for 10 min, and rinsed in PBS. Immunostaining of dermal sheets was performed with anti-mouse SLC Ab (1 μg/ml), a biotinylated anti-goat Ig, and Cy3-streptavidin. Anti-CD31 and anti-I-Ad/I-Ed staining were performed using biotinylated MEC13.3 (rat Ig2a) and FITC-2G9 (rat IgG2a), respectively (PharMingen, San Diego, CA). Confocal microscopy was performed with 488/568-nm excitation lines from a krypton/argon laser. Excitation and collected emission (Cy3, 590-nm long pass filter; FITC, 515–540-nm band pass filter) were performed simultaneously for both labels. Serial z-sections were taken at 0.5-μm intervals (∼0.75 μm/section). Skin-derived DCs (migratory DCs) were isolated by methods published previously 7 after 3 days of culture in cRPMI medium. For each experiment, 2–3 × 106 3-day migratory DCs were labeled with 100 uCi of 51Cr as sodium chromate (Amersham, Arlington Heights, IL) for 1 h at 37°C in 1 ml of buffer A. Cells were washed three times with buffer A and then resuspended at 3 × 106 cells/ml in buffer A. At 1 h before injection, 25 μg of control IgG, anti-SLC, or anti-eotaxin in 100 μl of PBS or PBS alone was injected i.p. into groups of mice (n = 4 or 5 per group). Cells (50 μl; ∼50,000 cpm) containing 5 μg of anti-SLC, control IgG, or anti-eotaxin, or no Abs where indicated were injected into the left hind footpads of the mice. Mice were sacrificed after 20 h, and popliteal and inguinal LNs along with the foot from the injected side of the animal were collected and counted in a gamma counter. A migration index for each animal was defined as the number of counts in the LNs divided by the number of counts in the foot multiplied by 1000. Normalization between experiments was achieved by first averaging the migration indices for control IgG from all three experiments in which it was injected (n = 13). Next, all migration indices within a single experiment were normalized relative to this average control IgG migration index value. Approximately 25% of injected counts were recovered in the footpads of injected animals. Approximately 1% of injected counts were identified in the removed LNs. Total RNA was isolated and reverse transcribed using standard methods. CCR7-specific PCR was performed using primers (5′-TGCTTCAAGAAGGATGTGCGG-3′, forward direction; 5′-GAGGAAAAGGATGTCTGCCACG-3′, reverse direction; 151 bp expected product size) selected from the published sequence for murine CCR7 17 . Epidermal cell suspensions were made from PBS-injected or TNF-α-injected (50 ng/injection site in 50 μl of PBS) BALB/c mouse ear skin at 18 h after injection as described previously 21 . LCs were removed using MK-D6 supernatant and sheep anti-mouse Ig-coated magnetic beads (Dynal, Oslo, Norway). Because SLC is known to be present at the mRNA level in lymphatic endothelium of the liver and small intestine, we attempted to detect SLC protein in association with lymphatic channels in the mouse dermis. We used an affinity-purified goat anti-mouse SLC Ab and immunofluorescence microscopy to localize SLC in channel-like structures in the dermis of 48-h skin explants (Fig. 1⇓A). The staining of lymphatics with anti-SLC was not uniform, presumably because SLC is secreted by endothelial cells and is retained unevenly. Anti-SLC and -MHC class II double-staining of the mouse dermis. A, Staining 48-h explanted mouse skin with anti-SLC Ab revealed tubular channels within the dermis (in red with Cy3). B, Anti-I-Ad Abs showed I-Ad-positive cells with dendritic morphology (in green with FITC) within SLC-staining lymphatic channels. C shows two computer-generated orthogonal sections of anti-SLC- (red) and MHC class II- (green) stained mouse dermis using confocal microscopy. The arrow in the bottom panel (Z plane) shows the location of the orthogonal section that results in the middle panel (Y plane). Costaining for MHC class II revealed brightly stained DCs, many in aggregates or cords, within these anti-SLC-stained structures (Fig. 1⇑B). Control goat IgG and blocking anti-SLC staining with recombinant murine SLC showed no channel-like staining, although aggregates of cells could still be detected in the dermis (data not shown). Anti-SLC and -CD31 (platelet endothelial cell adhesion molecule-1), a marker for lymphatic endothelial cells 22 , were colocalized in some but not all of the dermal channels observed (data not shown). Anti-CD31 did not stain lymphatics uniformly in dermal explants and was much brighter on vascular endothelium (data not shown). 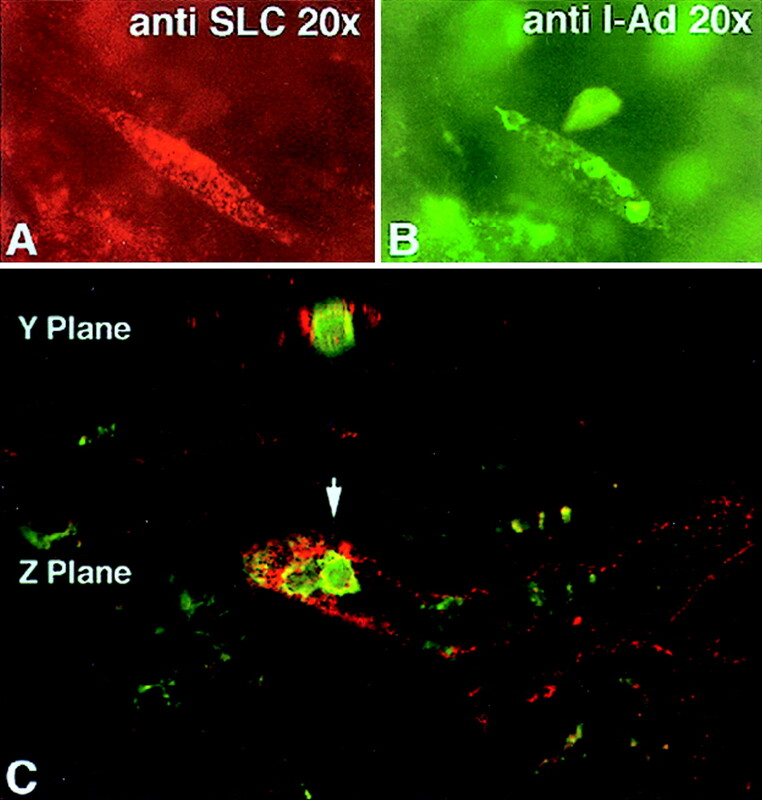 Conventional immunofluorescence microscopy could not distinguish between DCs that were adjacent to SLC-positive channels and DCs that were inside the channels. Confocal microscopy, however, revealed that MHC class II-positive cells were enclosed within SLC-positive channels (Fig. 1⇑C, Z plane). A cross-sectional view shows a DC surrounded by a narrow, uneven ring of SLC-staining endothelium (Fig. 1⇑C, Y plane, arrow). The colocalization of SLC-positive channels with both DCs and CD31 suggested that these structures were indeed lymphatic channels. 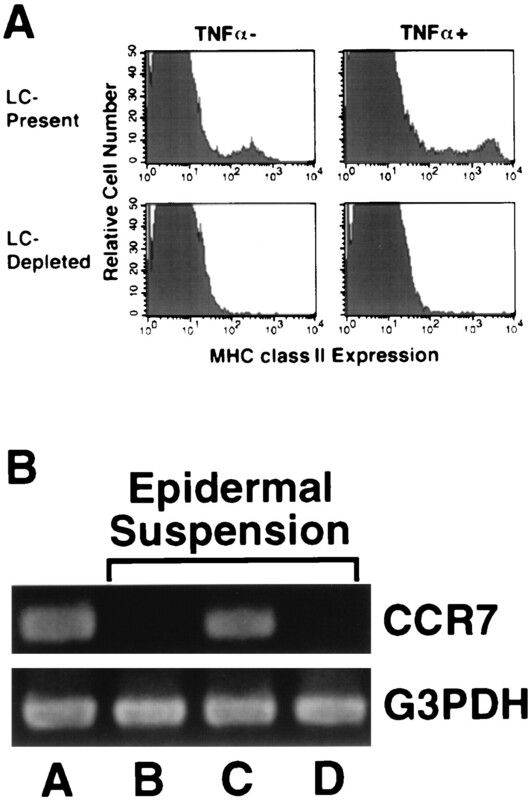 For DCs from skin to respond to SLC, we reasoned that they must express CCR7, a known receptor for SLC on lymphocytes. RT-PCR of RNA from a normal (unstimulated) mouse epidermis revealed low levels of CCR7 mRNA (Fig. 2⇓B, lane B). To determine whether the expression of CCR7 was up-regulated by inflammatory mediators, we injected mouse ear skin with TNF-α at concentrations in which MHC class II expression in LCs was strongly up-regulated (Fig. 2⇓A). We sacrificed the mice at 18 h after injection, isolated epidermal suspensions from skin, and used these suspensions in our CCR7 RT-PCR assay. TNF-α stimulates CCR7 expression in LCs in vivo. BALB/c mice were injected intradermally in the ear with TNF-α (50 ng/site) or PBS and sacrificed 18 h later. Epidermal suspensions were made as described in Materials and Methods. A, Flow cytometry showing MHC class II staining of epidermal suspensions from TNF-α-treated (right panels) and PBS-treated (left panels) skin with (lower panel, LC-depleted) and without (upper panel, LC-present) magnetic bead immunodepletion (see Materials and Methods). B, Total RNA was isolated from epidermal suspensions or from 3-day skin-derived, cultured DCs and used for RT-PCR with CCR7- and glyceraldehyde-3-phosphate dehydrogenase (G3PDH)- (loading control) specific primers. A, Migratory skin-derived, 3-day-cultured DCs (positive control). B, PBS-injected epidermis; C, TNF-α-injected epidermis; D, TNF-α-injected epidermis with depletion of MHC class II-expressing cells before RNA extraction. As shown in Fig. 2⇑B (lane C), an injection of TNF-α dramatically stimulated CCR7 mRNA levels. To confirm that the up-regulation of CCR7 seen in the TNF-α-injected epidermis was derived from LCs, we depleted the TNF-α-injected epidermal suspension of MHC class II-expressing cells by >95% (Fig. 2⇑A) and were no longer able to detect CCR7 in the LC-depleted fraction of epidermal cells (Fig. 2⇑B, lane D). Therefore, TNF-α, an agent that mobilizes LCs and stimulates LC maturation, induced the expression of CCR7 by LCs in the mouse epidermis in vivo. Skin DCs (LCs and dermal DCs) that emigrate out of skin explants have a mature DC phenotype 7, 9 . As shown by others, DCs in organ culture become phenotypically mature, with a high expression of CD86 and MHC class II after ≥1 day in culture 2 . By RT-PCR, migratory-cultured DCs expressed high levels of CCR7 (Fig. 2⇑B, lane A). Thus, resting epidermal DCs do not express CCR7, whereas activated or maturing DCs show dramatically higher levels. SLC effectively promoted the chemotaxis of migratory skin-derived DCs, even at concentrations as low as 2 ng/ml, using an in vitro chemotaxis assay; maximal migration occurred between 10 and 50 ng/ml (Fig. 3⇓A). Stromal cell-derived factor-1α (SDF-1α) has been shown by others to attract DCs, but at higher concentrations 15 . In our experiments, SLC was ∼100-fold more potent than SDF-1α. Murine RANTES (in vitro and ex vivo) had no chemotactic effect on the skin-derived DCs, which is consistent with the finding that mature DCs lose expression of certain chemokine receptors, including CCR5 23, 24 and CCR6 25 . SLC is chemotactic for mouse skin-derived DCs. Migratory skin-derived DCs or intact skin explants were incubated with the chemokines SLC, SDF-1α, or RANTES for 3 h (A) (in vitro chemotaxis) or 24 h (B) (ex vivo chemotaxis) at 37°C (see Materials and Methods). The data in A are shown as means ± SEM and are one of three representative experiments. Three independent experiments are shown for B, in which SLC (200 ng/ml, striped bar) was added to the media compared with control (media alone, solid bar). To determine whether SLC could function in an ex vivo model of LC emigration, we prepared mouse ear skin 7 and cultured this skin for 24 h with or without SLC in the medium. As shown in Fig. 3⇑B, SLC (200 ng/ml) enhanced the emigration of MHC class II-positive cells into the culture medium. Thus, ex vivo as well as in vitro SLC was able to stimulate the emigration of DCs from skin. To date, the expression of CCR7 on DCs has not been linked to DC migration in vivo. To determine whether SLC participated in the migration pathway of DCs from skin to regional LNs, we employed an assay based on a system that convincingly demonstrated that Ag-pulsed DCs migrated to regional LNs within 24 h after injection into mouse footpads 26 . We injected migratory skin-derived DCs into the footpads of mice that had been treated with neutralizing anti-SLC Abs, control goat IgG, anti-eotaxin, or PBS. Preliminary experiments showed that this anti-murine SLC Ab at 10 μg/ml fully neutralized murine SLC-stimulated chemotaxis at concentrations of ≤200 ng/ml. Moreover, membrane-dye-labeled DCs (identical with the ones used in our in vivo homing studies described above) migrated to draining LNs after injection into footpads under similar experimental conditions and could be easily observed by fluorescence microscopy within sections of draining LNs. Anti-SLC Abs inhibited the migration of the injected DCs to regional LNs by <50% compared with PBS treatment and control IgG (p > 0.005, Mann-Whitney analysis, Fig. 4⇓). The control IgG, PBS, and anti-eotaxin treatments were not statistically different from each other. Anti-SLC Abs inhibit migration of cultured DCs to regional LNs. 51Cr-labeled, skin-derived, cultured DCs were injected into the footpads of mice that had been pretreated with 25 μg of control Abs, anti-SLC, anti-eotaxin, or PBS. Goat-derived control IgG was injected into a group of four or five animals in all experiments. No treatment and anti-eotaxin treatments were performed once in comparison with control IgG. 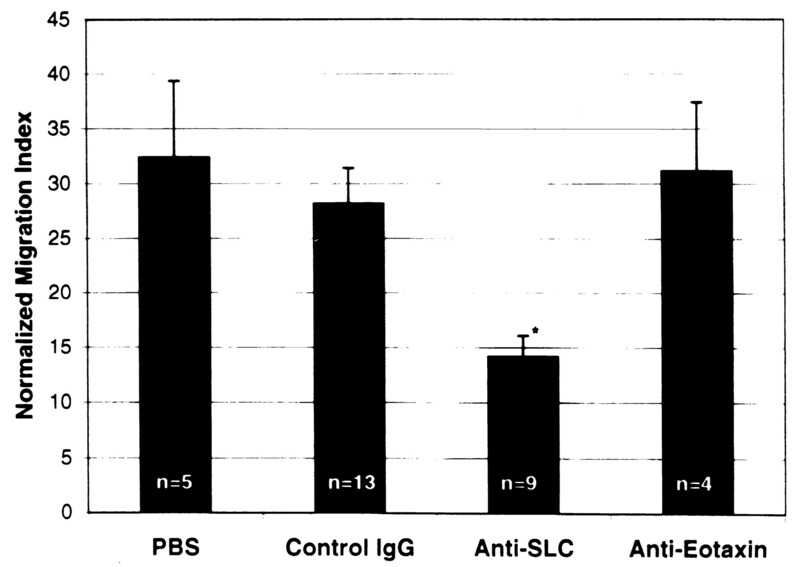 Anti-SLC treatment (n = 9) was performed in two independent experiments in comparison with control IgG (n = 9). The bar graph displays the normalized means ± SEM. The differences observed between PBS treatment and control IgG treatment vs anti-SLC were statistically significant (∗, p < 0.005 according to an unpaired, nonparametric analysis of data using the Mann-Whitney method). No statistical differences were observed between control treatments and anti-eotaxin (p > 0.5). The popliteal and inguinal LNs collected from the side contralateral to the injected foot showed only background counts (∼50–60 cpm). The stimuli that mediate DC recruitment into afferent lymphatics have not been identified. One clue that such a stimulus could be a chemokine was the finding that mRNA for SLC was expressed in lymphatic endothelium 11 in a variety of organs. Our confocal images directly demonstrate protein expression of SLC at an anatomic location (the afferent lymphatics) that is critical for the migration of DCs to LNs. Because SLC is a secreted protein, a gradient of SLC is likely to extend from the lymphatic channel into tissue. CCR7 has recently been shown to be up-regulated in peripheral blood DCs and in DCs derived from monocytes and CD34+ progenitor cells after activation with a variety of agents 24, 25 . Our in vivo results using TNF-α-treated skin showed that inflammatory mediators up-regulated CCR7 expression in LCs and that baseline levels of CCR7 were low. These results in bona fide skin LCs are consistent with the hypothesis that the response to SLC (and perhaps recruitment to afferent lymphatics) may be controlled at the level of expression of CCR7. Theoretically, SLC could act to recruit DCs from the epidermis to the dermis. We have determined, however, that neither SLC nor SLC in combination with TNF-α injected into mouse ear skin altered the number of residual LCs in the epidermis after 24 h compared with PBS or TNF-α injection alone, respectively. In addition, anti-SLC did not inhibit the migration of LCs from the epidermis in our ex vivo explant system (H.S. and S.T.H., unpublished data). Therefore, our data suggest that SLC acts to recruit the activated DCs from the dermis into lymphatics. The migration of activated, Ag-bearing DCs from peripheral tissue to secondary lymphoid organs is critical for the initiation of primary immune responses. Our in vivo blocking studies are the first data to demonstrate a function for the lymphatic expression of SLC in vivo. Further study of SLC in mediating DC trafficking will facilitate a better understanding of the mechanisms involved in this process and may allow the identification of targets for agents that may block Ag presentation even before the DCs enter secondary lymphoid organs. We thank Drs. Mark C. Udey, Stephen I. Katz, Andrew Blauvelt, and Nobuo Yamada for helpful discussions. Jay Linton and Wei Xiao provided expert technical assistance. ↵2 Abbreviations used in this paper: DC, dendritic cell; LC, Langerhans cell; LN, lymph node; SLC, secondary lymphoid-tissue chemokine; CCR7, CC chemokine receptor 7; SDF, stromal cell-derived factor.